"This flavored rice is a local favorite in San Antonio." In a large saucepan, heat vegetable oil over a medium-low heat. Place the onions in the pan, and saute until golden. Add rice to pan, and stir to coat grains with oil. Mix in green bell pepper, cumin, chili powder, tomato sauce, salt, garlic, saffron, and water. Cover, bring to a boil, and then reduce heat to simmer. Cook for 30 to 40 minutes, or until rice is tender. Stir occasionally. 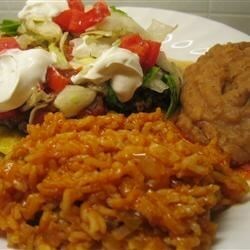 Watch how to make this top-rated Mexican rice dish. Instead of oil, I like to use bacon drippings. Sometimes, I like to use the oil and "cook" the rice in a large skillet until it appears brown. I then add the onion. If you do this, add a little more oil or bacon drippings. This was ok but I have had better. It was easy. The cook time listed is too long 25-30 min. is more then enough time. I would call this a Spanish rice, rather than a Mexican rice, but it was very good! Thanks for the recipe!